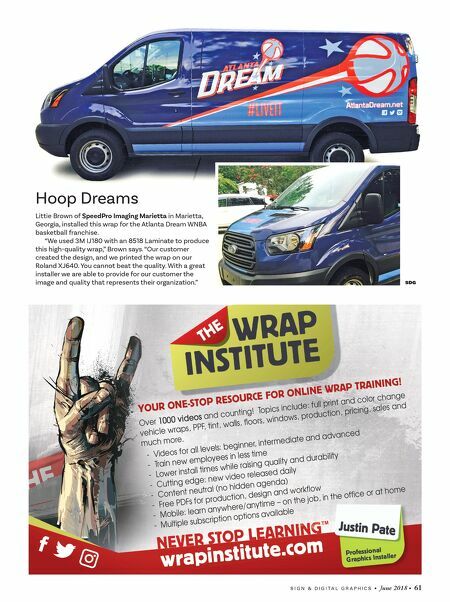 60 • June 2018 • S I G N & D I G I T A L G R A P H I C S WRAPS DIGITAL GRAPHICS Full Power Absolute Perfection in Sykesville, Maryland, created this Powered Perfect truck wrap. It was designed by Brandon Antol and Tony Semanick using Onyx RIP, Illustrator and Photoshop. The logo was used as a larger, more abstract design element extending from the cab of the truck to the box to create more of a cohesive design. Brandon and Tony added the image of a Generac generator, which was used as selling point for the consumer knowing that they're working with a higher-end reliable company. 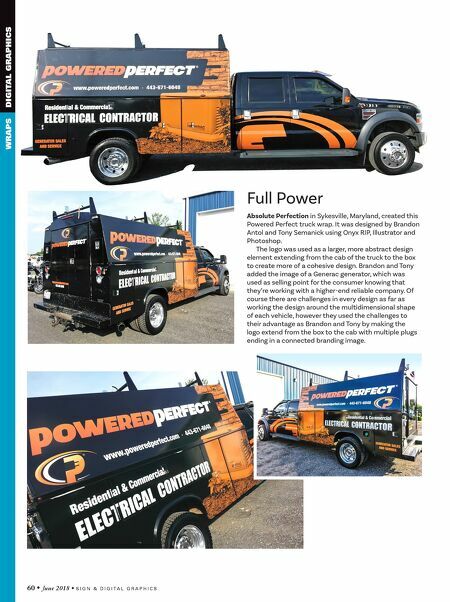 Of course there are challenges in every design as far as working the design around the multidimensional shape of each vehicle, however they used the challenges to their advantage as Brandon and Tony by making the logo extend from the box to the cab with multiple plugs ending in a connected branding image.